Anti-imperialists meet in Canada | Fight Back! 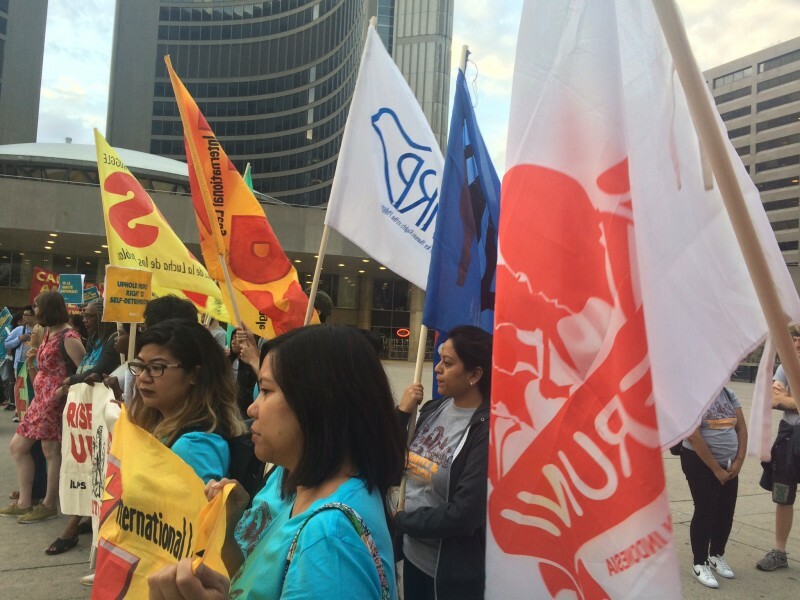 ILPS march in Toronto, Canada. A sizable number of participants were young, energetic Filipinos from the anti-imperialist organizations Gabriela and Akbayan. The conference was opened by a video messages of greetings and support from Jose Sison, chairman of the International League for People’s Struggle (ILPS) and Leila Khaled, Palestinian liberation icon and member of the Popular Front for the Liberation of Palestine. Panels featuring leaders of struggles against U.S. imperialism from the Philippines, Middle East, Congo, Mexico, Pakistan and across the world described the struggles in their countries and their movements’ resistance to it. Margaret Kimberly of Black Agenda Report spoke at length about the Black liberation struggle. She talked about the importance of the campaigns for community control of police in Chicago and Saint Petersburg, Florida. A march to the U.S. consulate was held on August 6, the anniversary of the day the U.S. dropped an atomic bomb on Hiroshima. Marchers chanted in Spanish, French, Tagalog and English. The march then went to and joined the public commemoration of that horrific war crime. The last day of the conference, Wilmer Barrientos, the ambassador of Venezuela to Canada spoke. He debunked the widespread misinformation on the current political unrest in his country that is being propagated by Western media. The conference ended with a call to action including all out for Rasmea Odeh in Chicago Saturday, August 12 for her going away party and in Detroit on Thursday, August 17 for her sentencing. The next international ILPS conference will be in Mexico next summer.